I’m honored to be part of this year’s McCormick Everyday Bakers. Today I’m sharing another favorite flavorful recipe. First of all, how is it already October? I mean, it’s my favorite time of year with all of these amazing excuses to bake, but boy does time fly! 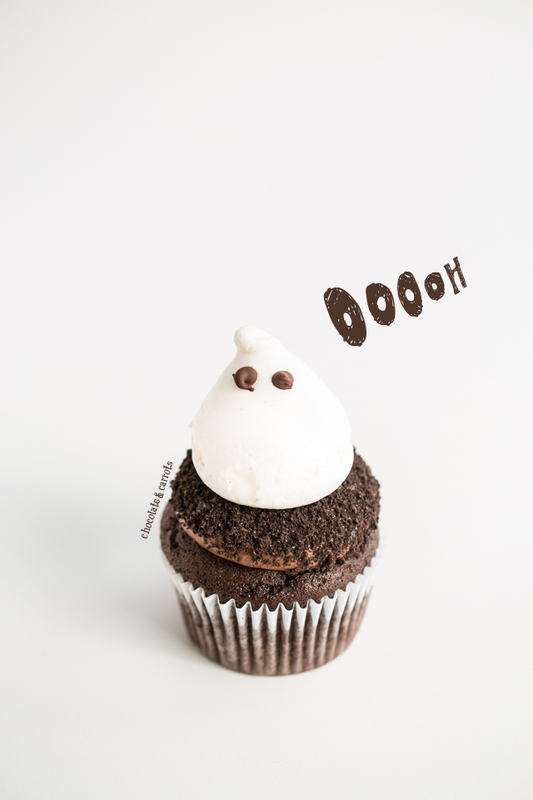 These ghost cupcakes will fly right into your mouth and be gone in minutes! The flavor is outrageously delicious. The vanilla and chocolate go hand-in-hand in every bite. And the layers of flavor go from the cupcake, to the icing and to the meringue! Don’t be alarmed. I basically took three recipes and combined them into one giant one. To make it easier on yourself, simply follow the instructions to make the meringues one day and then make the cupcakes and frosting the next! Easy peasy. You’ll have cupcakes in your face very soon! I could not for the life of me decide how to do the eyes for the ghosts either…so I did both! Welcome to my indecisive world. Half of the ghosts have mini chocolate chips and half have drawn eyes (both gel food coloring and food-safe decorating pen). I think they’re both so cute! Don’t you? More Halloween cupcakes for you! Also, if you hadn’t seen it, check out the most awesome Spinach Monster Ice Cream! First, you have to prepare the meringues. You may want to do this the night before. To do so, in your stand mixer or with your electric mixer, beat the egg whites and cream of tartar on low until foamy. Now, slowly increase the mixer’s speed until your mixture has doubled in size and begin to look opaque. While continuing to beat, slowly add half of the sugar and continue to beat until it becomes glossy and stiff. Slowly add the remaining sugar and beat until it can hold a stiff peak. With a large pastry bag and round pastry tip, squeeze out tall mounds of the meringues. 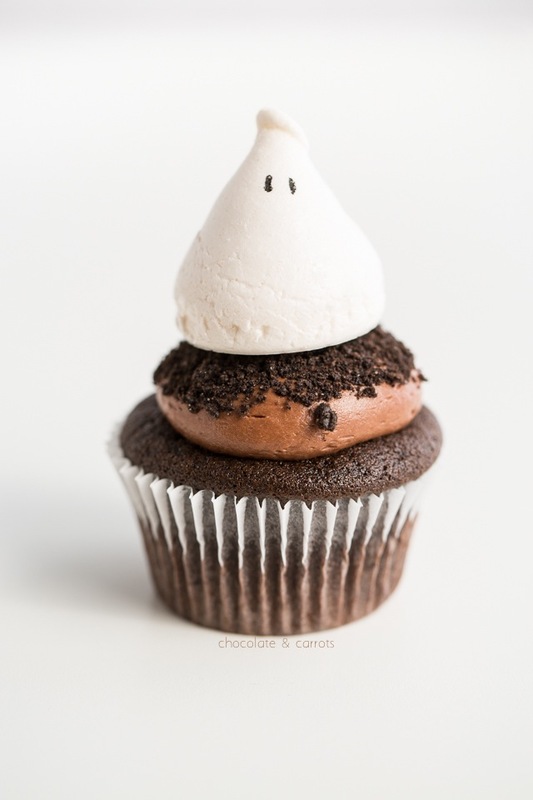 If you’re using the mini chocolate chips as the ghost’s eyes, gently place them on the meringues (otherwise you’ll add the eyes later). Bake for 60-90 minutes until hard to the touch. Turn off the oven and crack the oven 1-2 inches and let sit until the oven is cool (I left mine in overnight). Once they’re completely dry, gently peel off the baking sheets and if you haven’t added eyes, draw them on now with the food color and a toothpick or with the food safe pen. Next, you’ll make the cupcakes. Beat the milk, sugar, olive oil, apple cider vinegar and vanilla until combined and uniform in consistency (about 1 minute with an electric beater). Add in the remaining ingredients and beat until combined. Fill the cupcake liners in a muffin tin 2/3rds full (don’t over fill, they’ll spill over the top). Mine made 13 cupcakes, so I did it with two muffin pans. Bake for 18-20 minutes or until a cake tester comes out clean. Allow to cool for 5 minutes before transferring to a cooling rack. Allow to cool completely. Place in the fridge for 15 minutes to quickly and completely cool. In a microwavable bowl, microwave the chocolate chips in 30 second intervals, stirring in between, until melted. Set aside to cool for 10 minutes. In a large bowl (or your stand mixer), beat the butter until creamy (20 seconds). Beat in the vanilla and heavy cream. Beat in the powdered sugar (1 cup at a time) until incorporated. Pour in the melted chocolate and beat until mixed. Place in a pastry bag with a large round tip. In a blender or food processor, blend the chocolate cookies until fine. Place in a small ramekin. Squeeze a large circle of frosting on top of the cupcakes. Dip the cupcakes in the ‘dirt’. 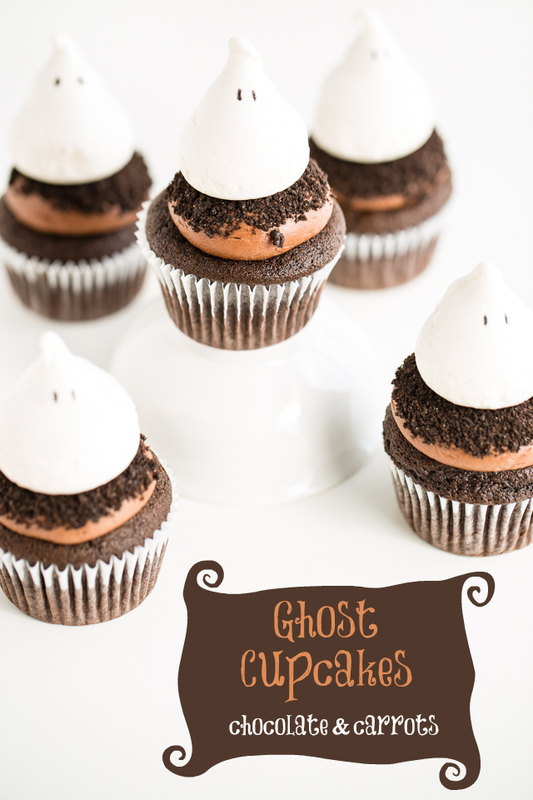 Squeeze a small amount of frosting underneath the ghosts and place the ghosts on top of the cupcakes. Servings: 12 cupcakes + a few extra meringues for a snack. This post has been sponsored by McCormick. I received samples and compensation for this post. 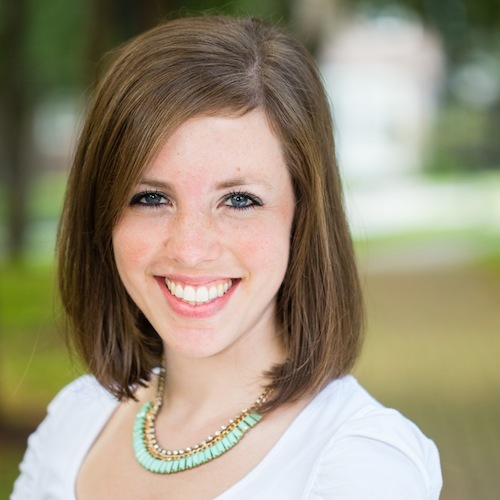 There is also an affiliate link in this post. All opinions stated are my own. Please read my disclosure policy for further information. These little guys are so cute! I bet they are delicious too. These are so cute I almost can’t stand it! HOW cute!! I am totally making these for my Halloween party. Love it! Very creative. These are absolutely adorable! I really love the layer of cookie crumble! Omigosh are these adorable! 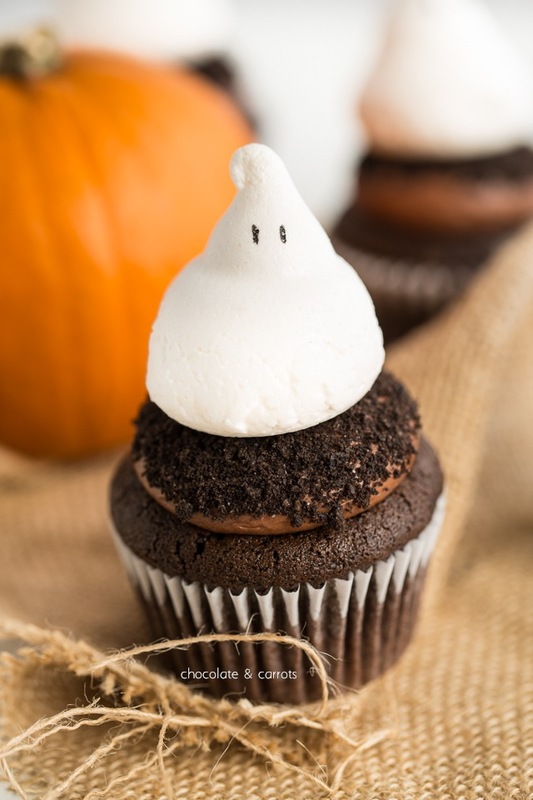 I can’t even imagine how exciting it would be to serve these cute cupcakes to some trick-or-treating little ones. I’ll have to find out!! 🙂 Thanks for a lovely, spooky, festive recipe! These are so cute! Love that the ghosts are made out of meringue! 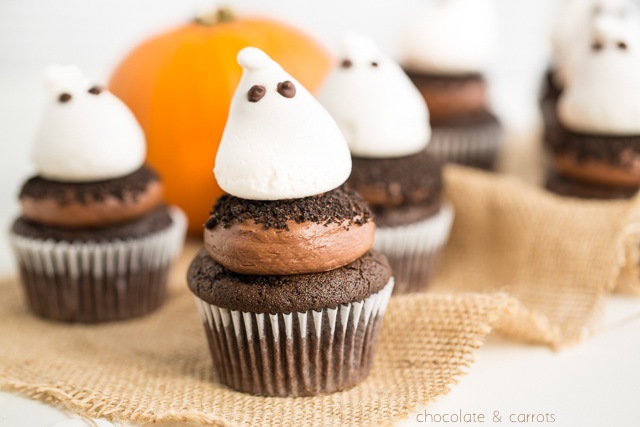 These cupcakes are perfect for a Halloween Party! This is cuteness that feels like it’s within the realm of my skill level. As someone who can’t even draw stick people, I need to keep it simple. 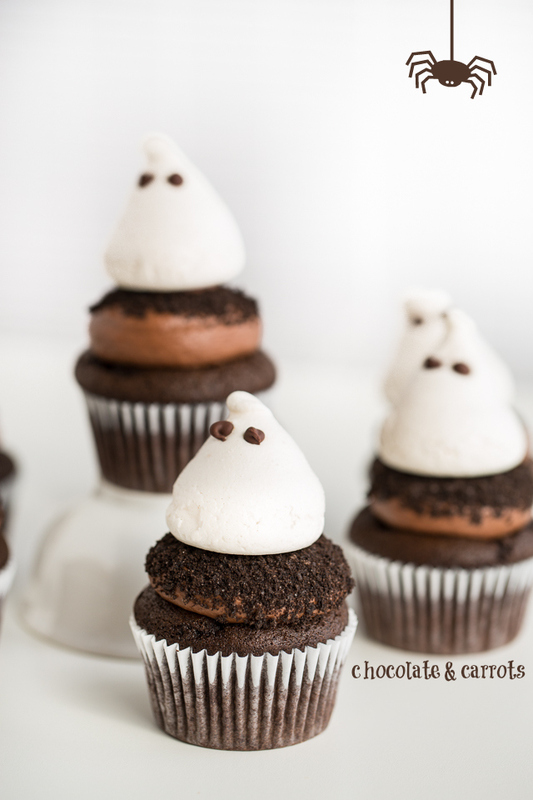 Meringue ghosts seem totally doable. I hope. These are so cute!! Love!! These are soooo cute! My little one would love them! These are adorable! Definitely making for my next Halloween bash. I like how you admittedly couldn’t figure out the best eye situation – it came out fabulously! Aww, thanks Ali! 😀 They did turn out pretty cute! 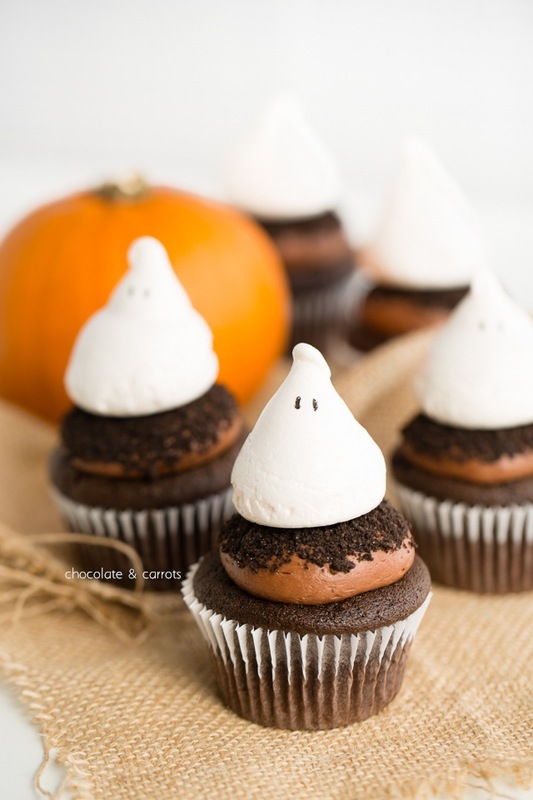 These cupcakes are too cute, definitely pinning on my Halloween board. Thanks for the smile! Cutest Halloween cupcakes I’ve ever seen! And it looks like they taste amazing too! Oh my goodness, not only are they so adorable, they look like they taste heavenly! Is the frosting perishable? Du the cupcake’s ned to be refrigerated? Great question, Lusy! I didn’t refrigerate my cupcakes and they were good for 2 days (at least that’s how long it took to devour them!). Happy Baking! Not only do these look adorable and creative, they look absolutely delicious!! These are too dang cute! !